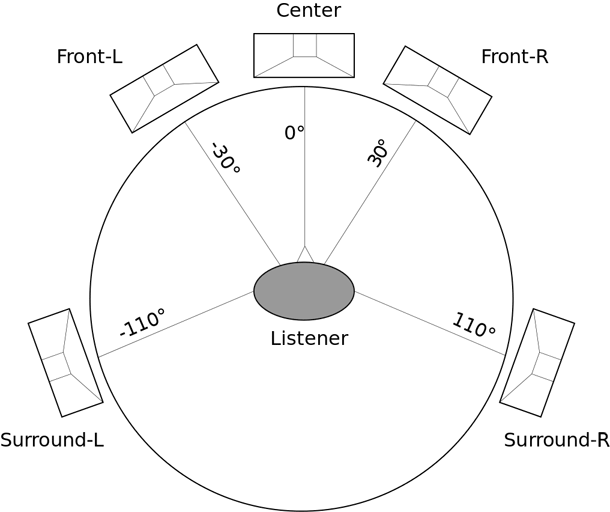 A 5.1 surround sound system uses 6 channels (feeding into 6 speakers) to create surround sound. 7.1 surround sound systems use 8 channels. The two extra channels of sound (and two extra speakers) provide a slightly better audio quality. All DVDs, video games, etc. Industry standard PS3, PS4, Xbox One and most Blu-ray players, although only approx. >150 Blu-ray movies feature 7.1 sound. Invented in 1976 by Dolby Labs. First used in theaters for Batman Returns in 1992 First theatrical 7.1 release was Toy Story 3 in 2010. Disney will use it for all future releases. 5.1 surround sound has 6 sound channels, and so 6 speakers. It includes a center speaker, subwoofer (for low frequency effects, such as explosions), left and right front speakers, and left and right rear speakers. As it has a smaller number of speakers and is the industry standard, it is simpler to set up, cheaper and suitable for small or medium-sized rooms. Recommended configuration for 5.1 setup. Subwoofer—not shown—can be placed anywhere in the 360-degrees. 7.1 surround sound has 8 sound channels. It uses the same 6 speakers as above, plus an extra two side speakers. The extra two speakers add more depth to the surround sound experience. As it uses more speakers, 7.1 surround sound is more expensive and is only suitable for large rooms. 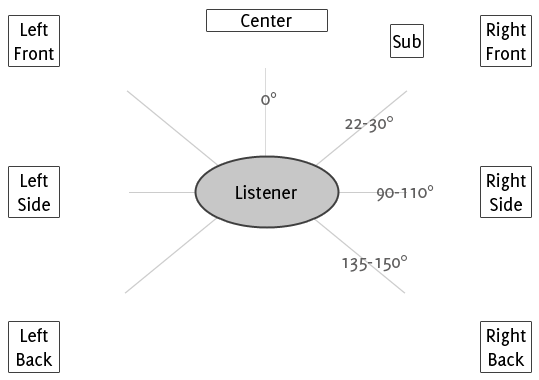 Layout and configuration for a 7.1 surround sound system. 5.1 surround sound is achieved with Dolby Digital or DTS. DTS uses less compression but is also less common than Dolby Digital. 7.1 surround sound can be achieved using Dolby TrueHD or DTS-HD Master audio. These are considered “lossless audio,” identical to the movie studio’s original. 5.1 is the industry standard and is used by most DVDs and Blu-ray disks, as well as by HDTV and video games. It is also the most common sound system in commercial theaters. Most Blu-ray players support 7.1 sound, as does the PS3. Most DVDs, Blu-ray disks and games are still produced using only 5.1 audio, but an increasing number of Blu-ray disks are being released with 7.1 sound as well. Prices for 7.1 surround sound systems are almost always higher than a 5.1 surround sound system from the same manufacturer in the same class. But there is a wide variation in prices charged by different manufacturers. 5.1 surround sound systems similarly range from $80 for a set of Logitech speakers to $1,700 for a KEF T305 home theater system. Prices for 7.1 surround sound speakers range anywhere from $265 for an Onkyo to thousands of dollars. 5.1 surround sound was developed by Dolby Labs in 1976, and was first used for a theatrical release in 1992 for Batman Returns. The first theatrical release to use 7.1 surround sound was Toy Story 3 in 2010. Disney intends to use 7.1 surround sound for all future 3D releases.